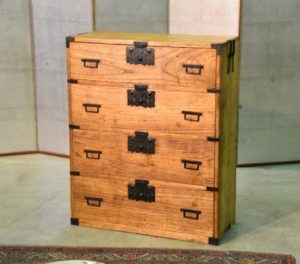 A very robust Kaidan Dansu (Step Chest) made of thick Japanese Elm (Keyaki) this piece came out of a Meiji Period house . $50 delivery in Sydney City, $100 to outer Sydney, $180 Blue Mountains, $330 to Melbourne or Brisbane, $650 to Perth, Cairns and Darwin. $400 to Adelaide and Tasmania. Please email for other areas or pick up from the warehouse. Interstate delivery is 2 to 4 weeks approximately. SKU: 13205. 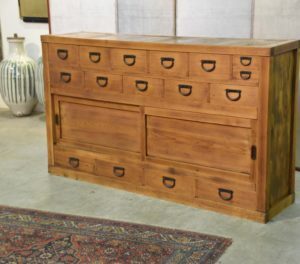 Categories: Chests, New Arrivals, Stair Chests.